With the abundance of self-published authors, you have to come up with creative ways to market a self-published book. While book tours are a great way to connect with your readers, they aren’t the most affordable method of promotion. However, technology has made it possible for an alternative. 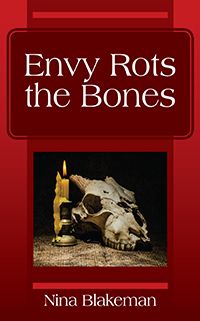 Take note from self-publishing Outskirts Press author, Nina Blakeman, who is taking her latest book, Envy Rots the Bones, on tour – a virtual book tour, that is. She will be featured on several blogs over the weeks and months ahead so keep your eyes peeled to learn more about her and her book. Luckily for us, Nina was kind enough to answer a few questions as the tour was getting started so that we can give you a sneak peek into the mind of the creator of Envy Rots the Bones. OP: Tell us a little bit about Envy Rots the Bones. What is it about? Nina: In Proverbs 14:30, the Bible is telling us that a peaceful heart gives life to the flesh, but envious feelings rot the bones. So, this book expounds on that concept. While it could be seen as a sequel, this book is a standalone thriller. It begins with the not-so-distant traumas of the Davis’s past that have led them up to that point. There really is no peace within the make-shift family. A contentious relationship between the protagonist, Faye Davis, and her sixteen-year-old step daughter, Emma Davis, turns violent. A reluctant father, Todd Davis, is forced to institutionalize his daughter. But once discharged, instead of bringing peace and reason to the situation, the psychotic Emma is pushed further to the edge and turns to the occult. But Emma’s not the only one walking a fine-line, as Faye herself takes matters into her own hands to take back what she feels she’s lost, Todd Davis. Both of these women use whatever means to justify their end, and in doing so, no one in their path is safe. Faye is one to rationalize her actions, but Emma, well, she just doesn’t care. Nina: After writing my debut novel, The Blow-up Man, I had people asking for more of the scandalous and shady Davis/Dolce clan. Nina: Anyone who likes thrillers or suspense. Also, someone who might be interested in some Louisiana Voodoo, perhaps. Nina: I think that what stands out in this book is the effect nature versus nurture has on the sixteen/seventeen-year-old Davis twin girls. Emma hasn’t fallen very far from the proverbial Dolce maternal tree and is dangerous to anyone within her reach. Ella looks to outsiders to make whatever sense she can of her life. The father, Todd Davis, is supposed to be the framework or skeleton of the blended family unit, but he’s shaky at best. It’s the envy of those within the household that rocks the very foundation of what family is supposed to represent. Nina: First, is that the threat comes from within what society is telling us to call a family. Everything is a family these days, right? Uh . . . no. The threat is not from a distant country utilizing biological warfare, a deranged man next door, or a teacher. Second, is that the protagonist isn’t perfect. In fact, she’s very far from that . . . imperfect, flawed, and beautifully human. Third, the backdrop is a scientific research lab in West Texas. I mean, do we really need another story taking place in New York City or at Harvard? Fourth, the sciences read authentic. That isn’t for everyone, but those that found it a little deep still enjoy the book for the drama and the thrills brought with it. The goal is to get into the reader’s head, nothing more. Nina: Yes, my debut novel, The Blow-up Man. Also published by Outskirts Press. Nina: I also am working on another Faye Davis novel, currently unnamed. OP: Thanks for your time, Nina! We look forward to learning more about you as you visit other bloggers! 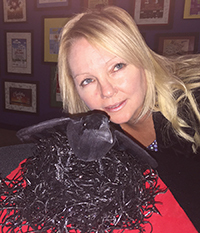 Nina Blakeman, BSN, PhD is an experienced professional with diverse experiences as a writer, educator, and administrative professional. She’s an avid golfer and fan of the Green Bay Packers. She lives in West Texas with her husband, Scot, and their three dogs, Lambeau, Goobie, and Dingo.